Pastor Inbarasu grew up in Vellore, a town near Madras (Chennai) City, South India. He is an ordained minister and affiliated with Evangelical Lutheran Church in America. He began his ministry as a theological educator, Pastor and later moved into hospital chaplaincy ministry in India. He served as a senior chaplain in the Christian Medical College and Hospital Vellore, India. This is the second largest Medical College and Hospital in Asia. 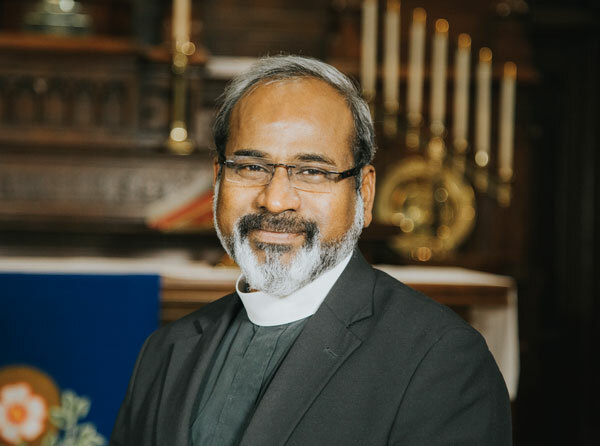 He provided leadership in Chaplaincy education for ten years, and had the opportunity to be the pioneer in coordinating the first kind of Clinical Pastoral Education in India. His love for pastoral education and ministry led him to the CPE Supervisory education. Inbarasu began his CPE supervisory journey in the Advocate Health System, Chicago and completed his training at the Iowa Health System, Des Moines. He had many opportunities to work at various hospitals in these systems and supervised Interns and Residents in the Institution and communities. In May 2007, he was certified as a CPE Supervisor with Association of Clinical Pastoral Education (ACPE). He is also certified as a Board Certified Chaplain in the Association of Professional Chaplains (APC). Inbarasu specialized in Clinical Pastoral Education, Chaplaincy ministry, Theology, Missiology, Counseling, Pastoral care, and Palliative care. His doctoral work focused on the Asian Indian Perspective of Nishkamakarma in Clinical Pastoral Education. He is married, and his wife is a bio-medical scientist and an educator. They have a son who is currently doing his Medical Education. Inbarasu is also interested in the development of cross cultural and international CPE. He has traveled extensively in India involving in the missionary work. He is actively involved in our local community and church and has a passion for providing pastoral care and training to individuals who give pastoral care. He received a D.Min., Doctor of Ministry in Religion and Health , Chicago Theological Seminary, Chicago (2007): M.Th., Mastor of Theology in Missiology, SAIACS, Bangalore, India (1991); M.A., in Public Administration, S.V. University, Tirupati, India (1989); M.A., in Philosophy, Osmania University, Hyderabad, India (1986); B.D., Bachelor of Divinity, Bishop’s College, Calcutta (1884); B.Th., Bachelor in Theology, in South India Biblical Seminary, Bangarapet, India (1983). Pr. Inbarasu says, "I am grateful to God’s call in my life and for our church to extend this call for me to serve in the specialized ministry setting. I am serving as chaplain educator and Clinical Pastoral Education Supervisor (CPE supervisor) and program Director in Alegent Creighton Health System. I do God’s mission by providing pastoral care and training others in providing pastoral care. I am grateful to God and our Church for this call to serve in this specialized ministry setting and be faithful to the healing ministry of Jesus Christ through my pastoral care, education and Leadership."